Happy Hamby Campers: Windy Woodlands! We've visited the Woodlands Historic Park a few times, and enjoyed touring the adjoining Living Legends facility also. The weather was fairly pleasant for previous excursions but it was definitely rather wild today! 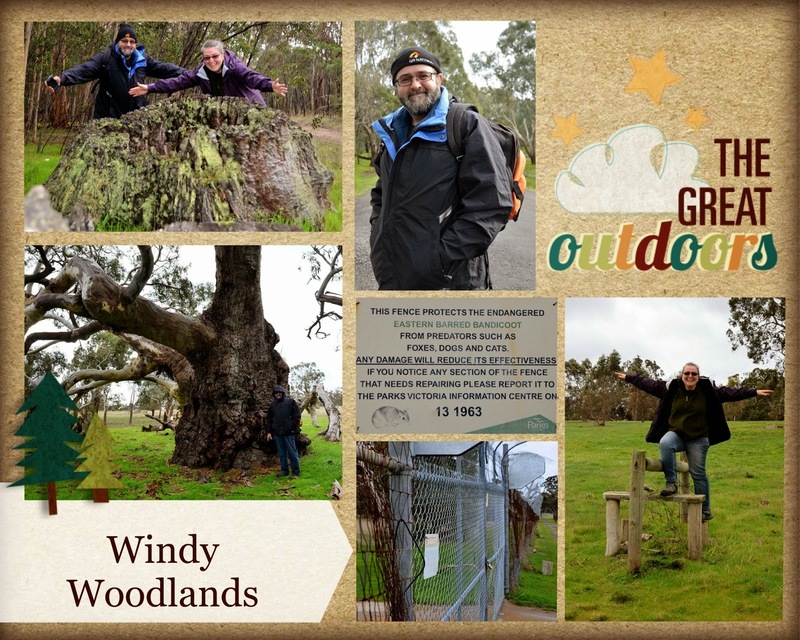 On checking just now it seems the recorded wind speed (at the time of our bushwalk) was near gale force. Yep, Nick and I were very keen geocachers! Our efforts logged another 13 found caches, bringing our overall tally to 393 - so we are well on track for finding our 400th during our anniversary month. Hooray! One cache was no longer accessible as there is an Eastern Barred Bandicoot (EBB) reserve located within the park. You can read about these endangered animals here. After walking a bit over 3km, we decided we'd done our dash for the day and returned to the car for a picnic lunch. A group of Conservation Volunteers were gathered at the picnic area, perhaps set to do some work for the EBBs. A trio of magpies flew down to supervise our lunch preparations. During the latter part of our picnic, a strong gust of wind blew food containers, food and other stuff onto the ground. The magpies were very pleased of some cheese and crackers but a bit ho-hum about the dried fruit!